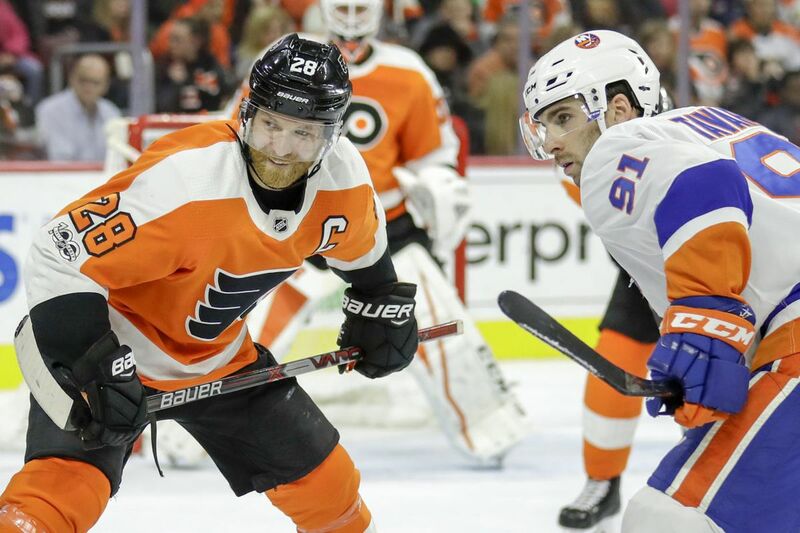 Philadelphia Flyers center Claude Giroux and New York Islanders center John Tavares are among the National Hockey League’s points leaders this season. The Flyers, trying to rebound from a 5-1 whipping by Pittsburgh, will host a New York Islanders team Thursday that features one of the NHL's top offenses. "They've been a team that has scored on a high pace all the way through the year," coach Dave Hakstol said after Wednesday's practice in Voorhees. "They're a tough group to handle offensively." The Islanders (20-16-4) are four points ahead of the Flyers (16-15-8) in the crowded Eastern Conference playoff race. Both are outside of a wild-card spot. New York is averaging 3.38 goals per game, third-best in the NHL entering Wednesday. On the flip side, the Islanders are allowing a league-high 3.58 goals per game. The Flyers, who dropped 4-3 and 5-4 overtime decisions to the Islanders in November, have averaged just 1.9 goals in their last eight games at the Wells Fargo Center. "We've got to get a little bit hungrier on the inside, offensively," Hakstol said. The game will match four of the league's top scorers: the Isles' Josh Bailey (50 points, second in the NHL entering Wednesday) and John Tavares (49, tied for third), and the Flyers' Jake Voracek (46, tied for seventh) and Claude Giroux (46, tied for seventh). New York's Anders Lee has 24 goals, third in the NHL. The Flyers recalled 6-foot, 200-pound left winger Tyrell Goulbourne from the Phantoms, and he is expected to make his NHL debut Thursday. Goulbourne, 23, has six goals, five assists, and 38 penalty minutes in 34 AHL games this season. Known for his fighting ability, Goulbourne was selected in the third round of the 2013 draft. He has done a nice job drawing and killing penalties this season. Ivan Provorov, who blocked a shot with his left leg and limped off the ice Tuesday but later returned, was able to practice. … Brian Elliott has made 14 straight starts, but Hakstol wouldn't say who will get the nod Thursday. Michal Neuvirth played the third period, his first appearance since Nov. 28, and allowed one goal. … The Flyers' penalty kill has allowed three goals in five power plays over the last two games. Overall, their penalty kill is 29th in the 31-team NHL, clicking at just 75.6 percent. The Isles' PK is even worse, ranked 30th with a 74.6 percent success rate. … Giroux's seven-game assist streak ended Tuesday.